Some say that the common currency prevents less productive economies from cheating by weakening their national currencies and forces them to become more efficient and competitive. Industrial production data shows that it is not the case. 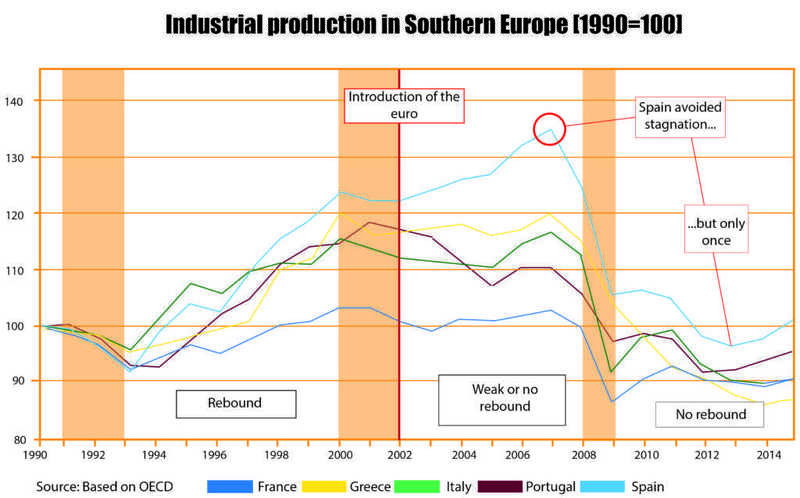 Italy, France, Greece and Portugal have not only stopped producing more; they are producing now less than in 1990! The decay started immediately after the introduction of the euro in 2002! 3. Southern Europe’s economies have lost their ability to rebound in industrial production alongside the adoption of the euro. In most of the most developed countries in the world industrial production has grown in volume since 1990, although a great deal of manufacturing capacities have been moved from the West to the emerging markets. 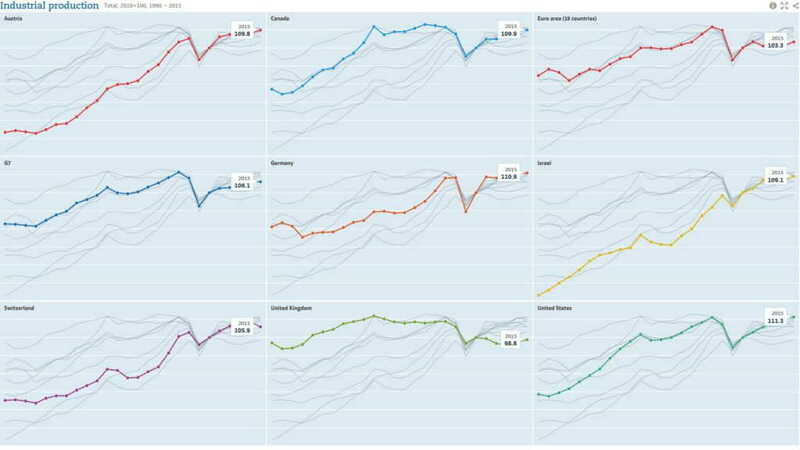 Moreover, in countries like the USA, Israel, Switzerland, Austria and Germany the output has surpassed the 2008 pre-crisis levels. 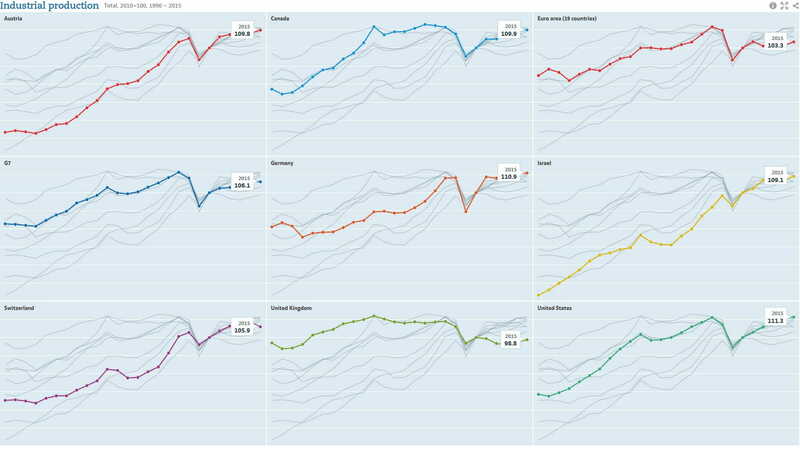 However, if we take a look at the euroarea or the Group of Seven (G7), then numbers are still lower than in 2008 but definitely higher than in 1990. A closer look at the European industrial production numbers gives a clear signal: something bad has happened after 2000. 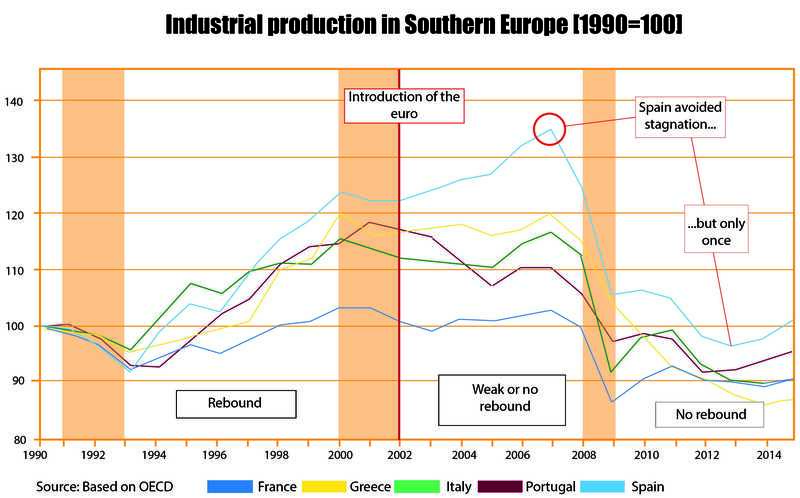 Before the introduction of euro, production trends ran more or less in the same direction. 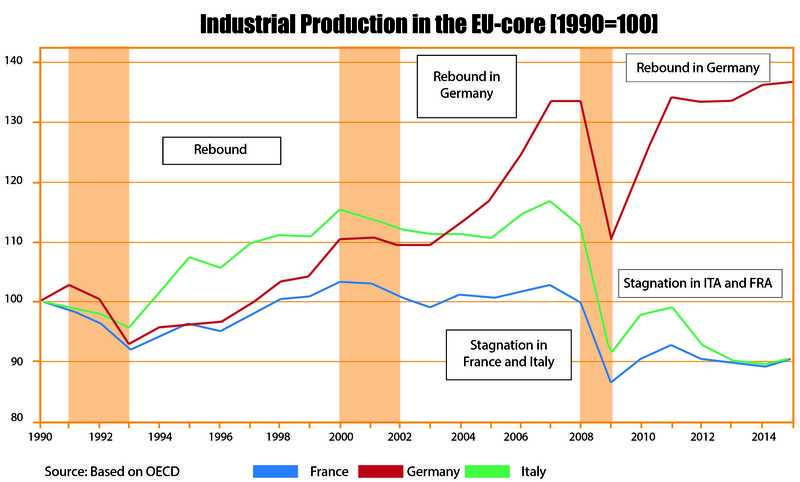 Meanwhile after the 2001-2002 crisis, French and Italian output did not rebound, while production in Germany expanded enormously and was able to reach the 2008 level quickly after the last crisis. 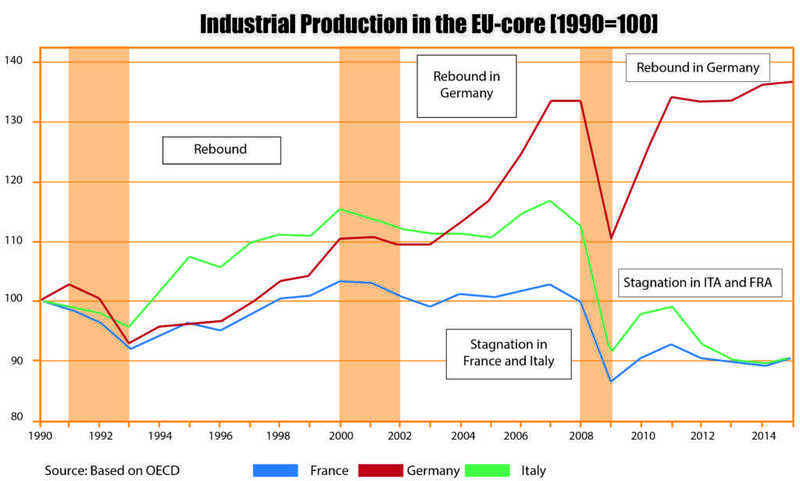 Industry in France and Italy not only has not rebounded but also has started to curb. Industry is very important for the economy, as it creates jobs and innovations. The euroarea in the current form is preventing Southern Europe’s industry from developing because of a different type of the economy there. “Roman” economies are not worse than than Germany’s. They just need other tools, so restricting all these various economies in the German fashion will destroy the euro as well as the European unity.